← WWA goes to Washington D.C! Help us make an impact with local legislators! This year for Advocacy Week, we wanted to be able to engage legislators and communicate to them how important WIC is in Wisconsin. 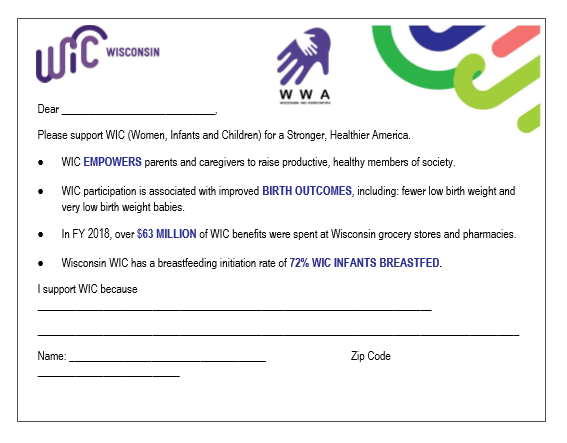 To do this, we will be using the enclosed postcards to tell our legislators why we support WIC. You may also encourage participants to fill these out if they show interest. WWA has provided you with 10 postcards that are already stamped and labeled to drop in the mail. Please feel free to print and send more than 10 if you desire! The postcards are addressed to be mailed to your county’s representative at their district office and each of Wisconsin’s Senators. Remember to try and make your comment personal, because personal stories have a greater impact. These postcards are meant to start a conversation and build a relationship with your legislator. Later this year, we will talk about additional ways to engage them in supporting WIC alongside us. Most of them have already heard from us in Washington D.C. earlier this year, so we hope to build on that foundation with your help! Please contact us with any questions! Have a great Advocacy Week! To become a member go to the Membership Registration page.